This tutorial will show you how to manually update your WordPress site. There are many steps, and the auto-update feature of WordPress works typically with few issues, but if you need to do this process manually, this tutorial will aid you. Begin the process by backing up your site first. Backup your current site data by going to Tools > Export. Export your site contents and use that file to import the data in-case of installation failure and your site crashes. Also take time to download all of the files of your site, especially any outside of the wp-content directory. After downloading, you may zip the files to keep them together and save space. Between these files and the XML file export, you should be able to restore your site if there are problems. To prepare for the upgrade, you should create a maintenance file and download the latest version of WordPress. Create an HTML file with content that alerts visitor to the site’s maintenance mode. Upload the file to the root directory of your web host server. Uploading uploading it will overrule the index.php file and be active. To “deactivate” the maintenance file, rename it from index.html to index.maintenance. When you wish to use it again in the future, rename it back to index.html. Go to WordPress.org and download the latest WordPress zip (or tar.gz) file, and unzip it to its own directory/folder. Update WordPress Themes: Either manually or using the auto-update feature, update all WordPress Themes. If you have Themes you are no longer using or need, consider deleting them. Updfate WordPress Plugins: Either manually or using the auto-update feature, update all WordPress Plugins. If you have Plugins you are no longer using or need, consider deleting them. Deactivate WordPress Plugins: Some manual installation methods recommend disabling WordPress Plugins, then turning them of again after the update. This is optional, but highly recommended. The next step is to replace your existing WordPress files with the new ones. Installing WordPress manually involves uploading files from your computer to the web server. While it might work to simply upload the files and replace the existing files, glitches in the Internet connection could result in partially uploaded files or file uploading errors. It is highly recommended that you manually delete the files before uploading to ensure a better chance at a clean upload, thus a clean update. Ensure you protect and do not change the wp-config.php or .htaccess file and other files necessary for your site to function beyond WordPress files. Delete the old wp-includes and wp-admin directories on your web host using an FTP client or Shell access. Upload any remaining loose files from the root directory of the new version to your existing WordPress root directory, protecting the wp-config.php, .htaccess, and other critical files not part of WordPress. In a web browser, enter the address of the site followed by update.php such as http://example.com/wp-admin/update.php. This will run the update for WordPress to ensure any modifications to the database is complete. Go to WP-Admin > Plugins to reactivate WordPress Plugins if you deactivated them. If you have problems logging in, try clearing your cookies. If your old site is still showing and you have caching enabled, you may need to clear the site cache. If for any reason you can’t figure out how to complete your installation please view the WordPress Codex page for the extended upgrade instructions. You can also restore your backup and replace the WordPress source files from your old version by visiting the release archive. Slugs are used in the permalink structure and are created by default in WordPress. If you do not choose to define the slug, it will be automatically generated using the title of the post or page, separating each word using hyphens. While the auto-generated permalink may contain some key words, WordPress has given the user the ability to set the slug to contain the most optimized key words. 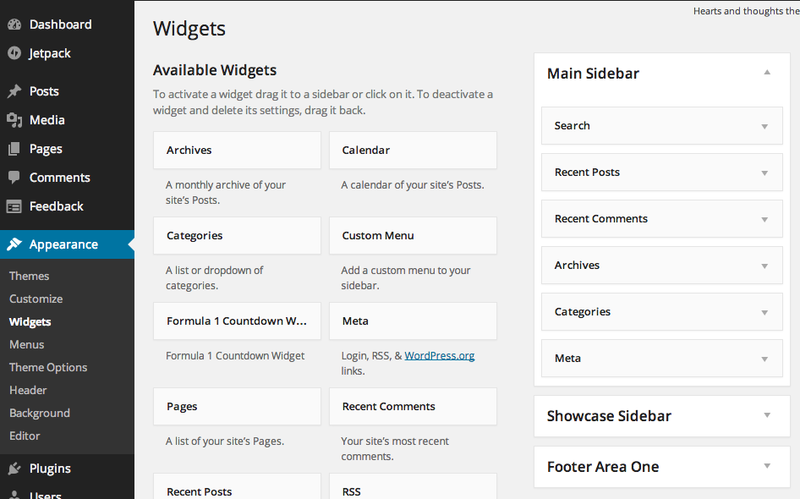 The following tutorial will show you how to edit your slug in WordPress. Click All Posts or Pages as seen in the new interface or run your mouse over the Page or Post icon and click All Posts or All Pages as seen as the WP–Admin. All images in this tutorial will feature these two examples in the same order. Here you will simply click Edit as seen in the first image or click Edit from the drop down box as seen in the second image. In the new WordPress interface you can simply edit the slug or click edit as seen in the second screenshot. After you have edited your slug don’t forget to click on Update for your entire Post or Page. A form allows a user to enter data that is sent to a server for processing. Forms on WordPress have the same limitations that an HTML form has. Granted, WordPress comes with a built-in form-making tool to make a contact form, and a tutorial for how to use that can be found in the “More Information” section below, but that’s not what I’ll be talking about. WordPress also has numerous Plugins that allow you to utilize a tool for creating custom forms, or you could create your own with some HTML. If you just install a Plugin, the creation process is dictated by that specific Plugin, so in this tutorial I’ll be talking about making forms with raw HTML. What Can a Form do? A form consists of a number of varying input types, that you supply to the user, in hopes of receiving feedback. There are 23 different input types, along with the “select” element for creating a drop-down list. The full list of input types can be found on an HTML input tutorial page. Since forms have so many input types, the applications for their use are almost endless. You could create an embedded calculator to determine a person’s BMI (Body Mass Index), or you could use a form to have users complete a survey. You could even use a form to allow users to alter program variables for software that you are running. How do I Make an HTML form? Technical Cafe actually has a great video that goes over the basics of creating an HTML form. Just watch the video below, and you can apply the basic input types they talk about with other input types to fully utilize the form creation possibilities of HTML. The following tutorial will teach you about categories and tags. What are the categories and tags?Think of the categories as a table of contents in a book. Categories are important because they help organize, and group content so it’s easy for users to find. Tags are a lot like the index of a book. Tags are keywords designated to an article, or a post that when a search is done, and a keyword matches a designated tag the content attached to the tag will show up. Tags can either be specific to one piece of content or multiple pieces of content. Where to find the categories and tags? When creating a post categories, and tags can be found to the right of the screen. Where to find categories and tags on the front side of a website? Tags can be found at the bottom of a post. Categories can also be found at the bottom of the post. An author is the person who is credited with writing a post or page on WordPress. By default, the author is set to the name of the logged-in user who originally created the post or page. In some WordPress Themes, the author appears a a link to the users Gravatar biography, in others it may the biography as part of the page or post. Page and post authors may be changed from the edit screen on new pages/posts, or by editing existing ones Admin Side Bar > Posts/Pages > All Posts/Pages then click item to edit. By default, the author selection menu is hidden. To unhide it, click Screen Options > Author. The Author Menu is now added below the Visual/Text Editor (click-and-drag the menu title to move). To change authors, click the drop-down selection menu: Author > Selection. (Only one author selection is permitted; be sure to update or save). Authorship may also be changed from the All Posts and All Pages screens, either by using Quick or Bulk Edit. If you are a cartoonist or artist, you may want to share your cartoons online in a way that they incorporate into your blog. Even if you do not draw pictures, you may want a way to showcase other images at the top of your blog. This tutorial will show you how to do this in both the Twenty-Eleven Theme, and the Panel Theme. Before we even decide on a theme, we need to make sure the digital images or digital images of comic strips are named properly, and include alternative text, or alt tags. This is important to do as you upload the media the first time, and make a habit out of it. 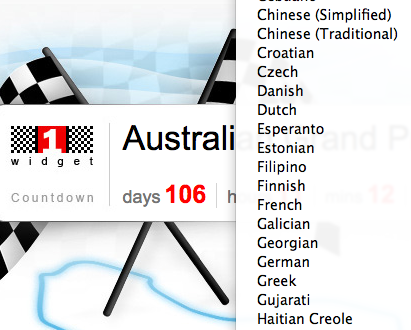 The F1 widget is for serious race enthusiasts. It’s a countdown clock that shows time left until the next Formula 1 competition race. It updates automatically for the next race. 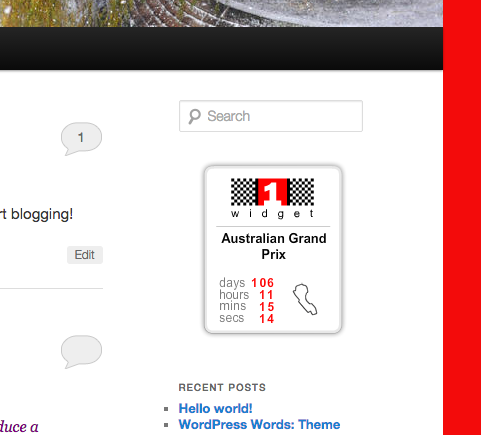 You can use the F1 real time countdown widget on your site, phone, blog or other online platform. Always be prepared for the next race. Keep this one on your computer desktop or blog/webpage too. 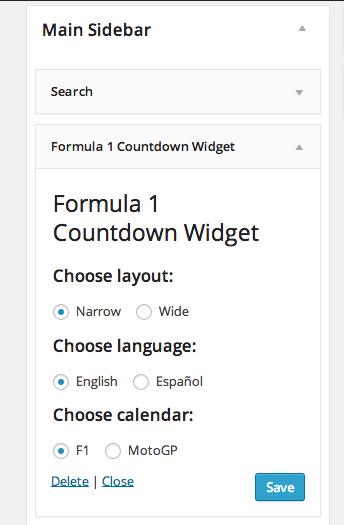 From “Appearance” select “Widgets” and then drag the “Formula 1 Countdown Widget” into the sidebar or other widget area based on your theme. In the sidebar you can then configure the widget to display as narrow or wide, choose the language (default is English), and then choose F1 cars or MotoGP motorcycles. In addition to adding a widget in WordPress, you can copy code provided on their website and add flash to other non-WordPress sites. The Formula 1 Widget is very easy to install. Whether you use a widget in WordPress or just copy the code and insert it into your site or blog wherever you want, you can keep a close watch on the countdown to the next big race. That is all, enjoy! When creating a business or commercial site/blog, you’ll want to hash out your policies, especially your comment policy if you are going to allow comments anywhere on your site. A Comments Policy is a statement defining your policy regarding comments on your blog. It is also a “responsibility statement”. It informs the reader of what you will allow on your blog, what you will not allow, and what they are allowed to do. It establishes publicly the responsibilities of each party involved. These days, a Comment Policy have become a web standard to help your readers better understand the rules when visiting. They love you. They really love you! Or do they? How do you know? Site Stats. Site Stats is a feature of WordPress.com and Jetpack WordPress Plugin that gives you information about your WordPress site visitors and statistics. You’ve just started your new WordPress site, and you are browsing the selection of Themes WordPress has to offer. You fall in love with a Theme and start filling it with content. Then you discover a huge flaw. You hate how your pictures align, and how your headings look. With a Sandbox post you can alleviate that issue. A Sandbox is a term related to the sandbox you might have played in and built sand castles in as a child. It is a playground for working on concepts and exploring your imagination. A link is a connection to another web page on or off the site. In WordPress, a link is easily made through the Visual or Text Editor. In the Visual Editor of WordPress, type the words you wish to turn into a link first. Why change the default post category? If your website or blog frequently makes posts that relate to a particular category, this option will make your life easier. It’s convenient not to have to select the same category over and over, especially if you’re going to be writing an article series or be live blogging for an event. Links are a vital part of the World Wide Web. Anything can be made into a link, from words and phrases to images. A link list is, as the name implies, a list of links. In HTML, a list of links can be easily coded with <ul>, <ol>, <li>, and <a> tags. In WordPress, these are the same exact tags used to create a link list inside a post. In this tutorial, I will walk you through the process on how to create a link list inside a post. Lorelle’s article, “The Art of List Making,” is a valuable resource on making link lists and it serves as very useful information for this tutorial.